Yay, it's time for a sponsor feature! Denise of The Blue Gardenia has the dreamiest selection of vintage patterns. I could seriously spend hours on her site. (Oh wait, I have spent hours on her site!) 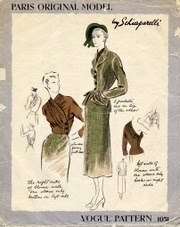 Denise also has some really interesting insights into pattern history and preservation. Her patterns come lovingly packaged and you can just tell how much she treasures them. Read on for my interview with her! 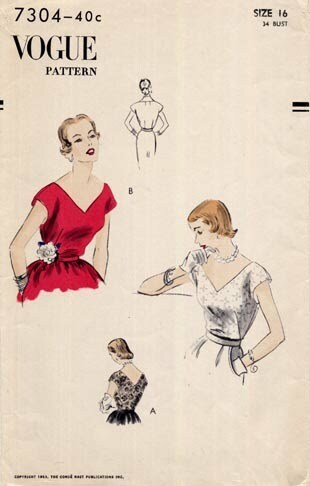 How did you get into selling vintage patterns? I was tired of city life. 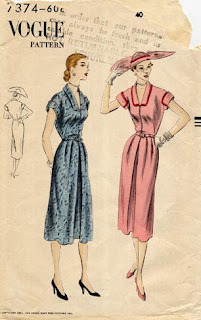 I loved vintage patterns and had been buying them for years. I had been selling on Ebay since 1996, and I thought, "Hmmm. Maybe a web site. Maybe that would support me in a small town." Ha! I took the plunge in 1998, left Houston, Texas, and my journalism career. Can't say I haven't looked back — I have —but I haven't turned to salt — yet. Where does your shop name come from? I wish I could say it was inspired by the movie. Alas . . . it came from sitting at the computer and trying to find a name that hadn't been taken yet. Later, I met someone who asked if the shop name was inspired by the movie. I bought the videotape then, and I love the movie. You seem especially interested in preservation. Tell us about that! Also, any tips for using and storing our patterns? 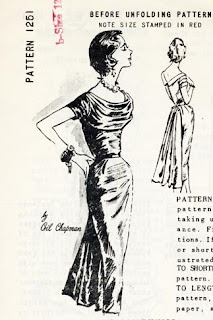 I definitely want patterns to be saved and restored. They are a part of our history as women. They are about our dreams, about what we wanted to happen, but perhaps did not make happen, about a life we wanted to live, but perhaps did not. I think patterns clearly show that certain skills used to be honored, skills that are discounted today. For instance, the cute house dresses women used to wear. Today, we wear sweats or jeans. Yoga clothes. Yikes! We are so sloppy. And I include myself in that criticism. The hat, the crisply starched white dresses, the white shoes that nurses used to wear commanded respect. The nurse's uniforms conveyed an authority that the sloppy scrubs with teddy bears that many nurses wear today do not. I, mind you, am a lousy housekeeper. There are dust bunnies lurking everywhere in my home! And I did not ever want to be a nurse or a housekeeper or a secretary. But patterns — and perhaps the wisdom that sometimes comes with age — have nurtured a respect for those careers that were once considered the only acceptable careers for women. As I said, I could go on and on. But enough babbling. I store patterns in archival sleeves and use comic book backing boards as well. Then I store the patterns in long comic book boxes. They work very well. 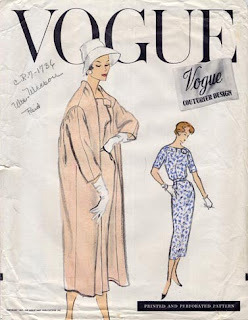 As for using vintage patterns, I recommend tracing the original. 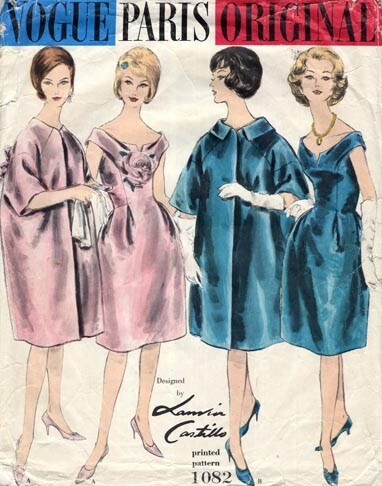 I also know seamstresses who reinforce the original by ironing on interfacing. Is that criminal? You decide. Have you ever found anything weird or cool inside a pattern envelope? Newspaper clippings, which I love to read. Buttons. Seam rippers. My favorite thing was an old letter written by a lonely woman to her lover. The woman's husband was stationed in South America, and the woman felt very isolated there. The letter was written while she was listening to records and drinking brandy. It's in one of my desk drawers. I read it every few months. It raises so many questions for me. I can ponder them for hours. How did the letter come to be in the pattern? Did she mail the letter? Was her lover a dressmaker? And what about her husband? Etc. What's the most amazing pattern you've ever found? Most amazing? Mmmmm. Vogue Paris Original 1051, which is one of the original VPOs. It's a suit by Schiaparelli. I've blogged about it here. Many thanks to Denise for her support and for stocking such amazing patterns! 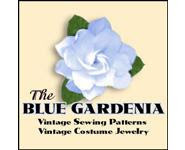 Go visit and shop at The Blue Gardenia. Enjoy! I would buy copies of any of these in an instant. Is there a copyright issue, or could some enterprising person scan them and offer them for sale? Denise, I love what you have to say about patterns being a part of women's history! I think preservation is SO important. Scholars should (and will soon, I hope) look at ephemera like patterns for clues as to how everyday women lived and worked. If I could clone myself and go to grad school I'd do it! I love Blue Gardenia! Mostly because the patterns are so well taken care of - treated with the respect they deserve! Hers are the only vintage patterns I have ordered that came not only in the plastic but with the cardboard to keep it from bending. I thought that this was a lovely idea for shipping purposes, but I see that maybe I should be storing all my patterns like that. Ironing interfacing to the pattern has been done ever since there was iron on interfacing. But I have never been that ambitious. I just never took as good care of my patterns as I now know I should have. In fact, I moved from a big house to a small house and threw away a big box of patterns....I should be shot at sunrise!! Now I am looking to buy some of the patterns that were in that box. I think that putting interfacing on patterns would be much like refinishing an antique piece of furniture....loss of patina and value. But if I extend that line of thinking then the never-been-taken-out-of-the-envelope pattern has the most value. And what fun is that? I like wondering who used this pattern before, what fabric and trims she may have used and where was it worn. Doreen, I love getting a collection from one dressmaker. I always feel that I know the woman. I love to think about her life, what fabrics she used (it's so nice when there's a clipping! ), what her house might have been like. And I like knowing that other people value her patterns. It's validation for her choices, whether the dress may be a simple apron she used while making biscuits or a glamorous gown she wore to a ball. Oh, I missed this post yesterday! I love the Blue Gardenia and all the patterns I have gotten there! (And yes I've spent many many blissful hours surfing that website too.) Great to read this interview, thanks! I definitely appreciate and agree with Denise's attitude toward preservation, and have a definite fascination about the women (presumably) who were the previous owners/users of patterns in my collection. I feel like if these delicate things have survived this long, I have to be a steward too and keep them as much as possible in a condition that can be passed on and reused after me too... not that I am ready to surrender custody any time soon!